He is in a rush - what's in his bag a cell phone, maybe a laptop ? Move your mouse to his bag. "I am head of Security: I have a practical security problem. 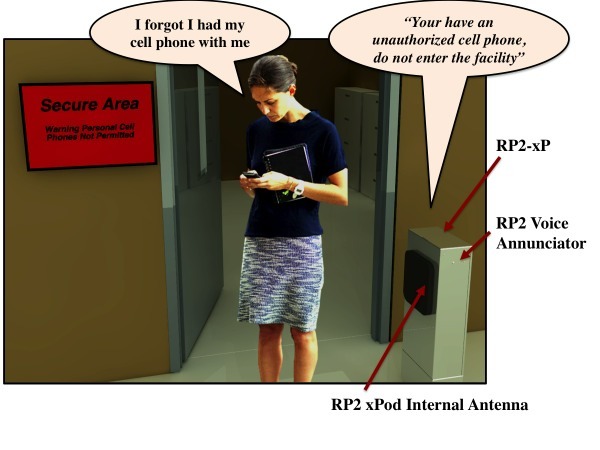 How do I prevent accidental cell phone and sensitive item entry events into our secure areas ? DoorGuard xP is a Standalone RuBee wireless cell phone, laptop, and sensitive item, secure area exit/entry detection solution. 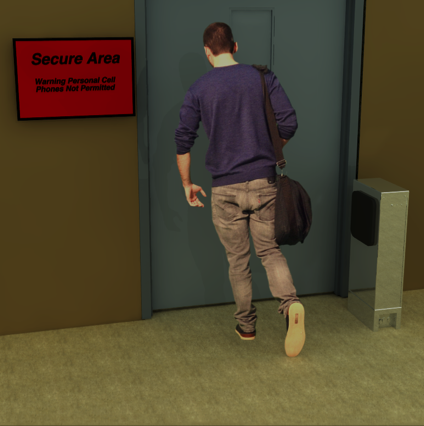 It detects RuBee tagged assets as well as people entering or exiting a portal - a door. DoorGuard xP and RuBee has reduced accidental cell phone entry, in installed sites by over 98%. With optional external antennas it can virtually eliminate any risk of accidental sensitive item entry. Visible has over 200 DoorGuards installed worldwide, with over 1,200 total installed RuBee sites. 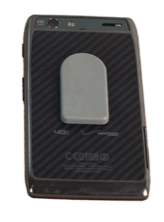 A RuBee Portal Platform with an Internal Antenna (RP2-xP), special firmware will detect single door tag events at the 96-98% level, even if the asset is placed in a steel brief case, or purse. Unlike RF signals RuBee signals are not blocked by people, or steel. With an optional second zGate antenna or other optional external antennas, double door detection is at a 99.9% or better level. We program unit to detect unauthorized cellphones, or remind user to remove batteries from government cell phone. The RP2-xP requires power (110 or Volts AC) and it is immediately operational. That takes ten minutes or less. It scans for tags and safely detects a tag though a single door. The RP2 comes with a buss for up to ten base stations, that can drive a total of 20 antennas. The external antennas and RP2 are all synced so they can be focused to a very small area at the door. Because RuBee is a magnetic technology it is not blocked by people, or steel and detects tags at any angle. We recommend at least a zGate for double doors but adding a zPod and xMat (seen to the left) makes this a seriously hardened security system. Near impossible to get though gate without detection. If covert entry or exit of assets is of concern, auxiliary external antennas are important. These antennas require additional base stations in the RP2 buss, and may require professional installation. Firmware can be remotely configured. All RP2's are networked devices, and can be optionally be configure to run under, Alert 20/20 Armory 20/20 or Store 20/20. RP2-xP's are also compatible with any GateGuard network. 1. Why can't I do the same security system for less money with RFID? Both active and passive RFID tags are blocked by steel and water. RFID tags are blocked by your body and even your hand, and will be missed most of the time if placed on a cellphone, that is kept in a pocket, backpack, purse or brief case. Second issue: RFID transmitters are usually 1-4 watts and can be detected miles away. That is considered a "Compromising Emanation" and creates both a tempest and target security risk. Recent work has shown that it is possible to read an RFID tag 100's of feet away, and may be possible to read up to a mile away (see DEF CON 18 Video). RFID is great for manufacturing, and many retail applications, but has not worked well in harsh environments and not well where security is important, or any explosive risks. 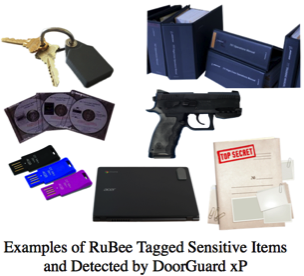 Finally, RuBee system is cost competitive with RFID even in RFQ and RFP's for security systems. 2. Isn't RuBee just another kind of RFID ? No RuBee is steel and water immune because it uses magnetic fields not RF fields for communication. RuBee is the only Automated Identification Technology (AIT) that provides real-time audits and inventory for steel items, on steel racks or shelves, and is not blocked by humans or liquids. RuBee is a packet based active protocol and an IEEE standard (IEEE 1902.1). 3. Is RuBee safe for humans ? Any health risks ? RuBee is about 1 million times below the US Occupational Safety and Health Administration (OSHA) RF safety limit for humans. RuBee has been approved by the FDA as a Class 1 Non Significant Risk (NSR) in operating rooms, and Mayo Clinic studies show no risk for pacemaker or ICD patients. 4. Is DoorGuard xP or RuBee a security risk ? RuBee has no tempest target or eavesdropping security risk because it is magnetic. RuBee is only wireless AIT that has been approved for use in secure areas by the US National Nuclear Security Administration (NNSA) for use by the Department of Energy, and for use on weapons by the Department of Defense. RuBee is in-use in some of the most secure areas within the US where WiFi, Bluetooth, RFID, Zigbee, UWB are not allowed. 5. Is RuBee safe near flammables or explosives ? RuBee is both HERO ZERO and HERF ZERO. RuBee is the only wireless AIT that has a zero Safe Separation Distance (SSD) on for tags and base stations on fused ordnance certified by NAVSEA under the Hazards of Electromagnetic Radiance of Ordnance (HERO) program. All other RF systems have a SSD of 3’ to 12’ and are banned from most explosve facilities. RuBee is the only wireless AIT to have a zero SSD on nuclear weapons certified by Department of Energy. RuBee has a zero SSD under Hazards of Electromagnetic Radiance of Flammables (HERF), and is about one (1) million times below power levels considered dangerous near explosives. Most of the energy in a RuBee field is magnetic, and even the most powerful base station produces only about 40 nano-watts. 7. What about ID's, can DoorGuard xP read tags in a wallet, purse or neck lanyard and Identify the person. Yes, we have several tags that can be used for personal ID and asset and access control. We have a horizontal and a vertical neck lanyard CAC card holder that is also a RuBee tag. We have a dongle tag that can be kept in pocket or purse or lanyard. We can log entry and exit of people or change asset status contingent on ID (see Laptop Video). This is special firmware that has to be added to DoorGuard xP. We can read tags in a wallet. We have a keypad tag that can be used to enter a PIN for access control. 8. What is the difference between "asset control" and "access control". DoorGuard xP has optional dry contacts that can be programed to set off alarms, or open a door. We also have an optional keypad tag, that can be used at a door to enter in a PIN. 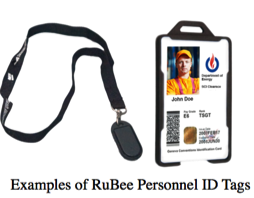 If the employee has a Rubee ID tag all he or she has to do is enter in PIN, and door opens. If other employees follow and have tags their entrance is data logged as well (often call tailgating). 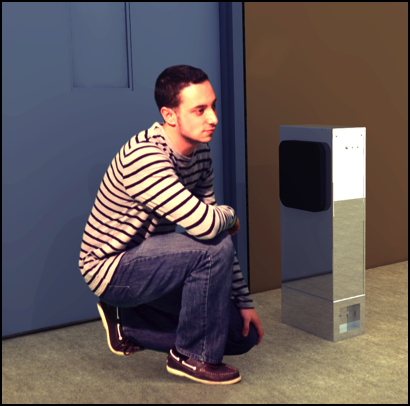 We can place a DoorGuard xP at key locations to set off an alarm if person walks by without a tag. That is access control. Asset control is illustrated in the Laptop Video. The ID card and asset tag are read by DoorGuard xP and check to see if person is authorized to enter/exit the facility with that asset. We also have the option to issue an asset by changing a security word in the tag that allows the asset to exit the facility. Asset control logic can be as simple or as complex as you like - assets can be issued only for one door, or only for one set of buildings only with one group of ID's. These more advanced features are managed by Dot-Tag and 20/20 application. 9. What about other sensitive assets, what other assets have you tagged and read with DoorGuard xP ? We have tagged just about one of everything, few relevant examples are shown in the picture to the right. Keys, manuals CDs, weapons both handguns and long guns, USB flash sticks, laptops, documents folders. We have several advanced options for items that are protected from covert loss, rather than accidental entry. We can offer a trip wire option that allows us to detect a tag has been removed from an asset. We have developed a unique one-time-pad authentication algorithm that provides high level authentication and "proof-of-life" for an asset. We also have issuance stations that can change a security word so no alarm event on exit. 10. Explain difference between accidental entry/exit and covert entry/exit. Accidental entry/exit is when an employee makes an honest mistake. 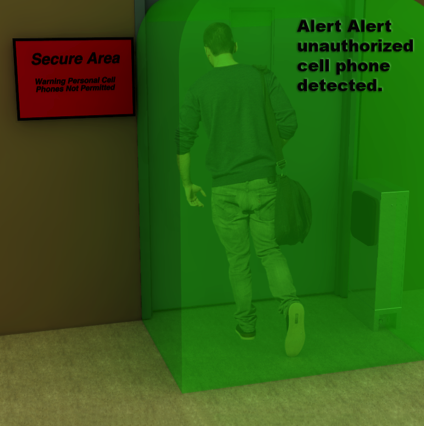 Taking a cell phone accidentally into a secure area is a good example. That can cost many thousands of dollars in fines and paper work, but very unlikely motivated by any covert motive, just a broken rule. Covert exit/entry is an act that is intended to deceive, is clandestine and may involve attempt to steal classified information. DoorGuard xP can help prevent both, but covert exit/entry protection requires auxiliary antennas and tags that may have special features (see External Antennas and Introductory Video). 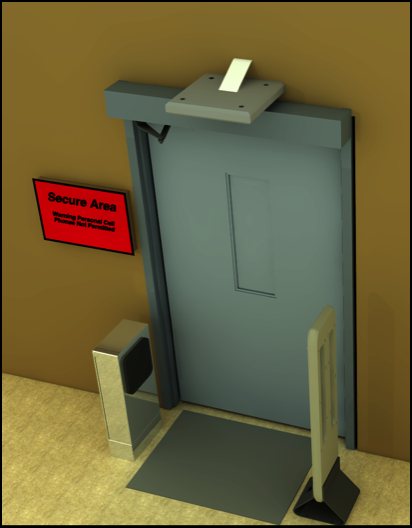 Accidental entry/exit in a standard single door configuration can usually be managed with simple DoorGuard xP. Accidental is simply when someone forgets to issue an asset, or forgets they have an asset - an innocent mistake. 11. Do I need a network or software systems to make DoorGuard xP work ? No you just need a few RuBee tags, and 110 or 202 volts AC for the RP2-xP. We ship the RP2-xP with firmware you need for your application and it is standalone. You can optionally add a network and systems software (Dot-Tag or a 20/20 application), but they are not required to make DoorGuard xP work. 12. What is Dot-Tag and Alert 20/20 ? Alert 20/20 is a semi-custom application that runs on top of Dot-Tag. It provides DoorGuard and RP2 alarm control, firmware maintenance and configuration. Alert 20/20 also provides, event reports, XML exports of events and audit trials of all events. Both Dot-Tag and Alert 20/20 run on any tempest hardened Linux server. All RP2-xP’s are Alert 20/20 and Dot-Tag ready. RP2’s can run standalone, or optionally be placed on a secure TCP/IP network, and all events may be data logged via Dot-Tag and Alert 20/20. 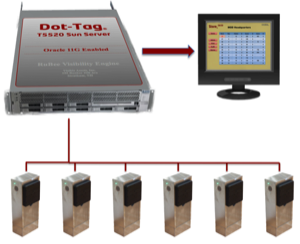 DoorGuard xP and the RP2-xP can be used either in standalone mode (no network) or as a an appliance on any Dot-Tag network. 13. How much do RuBee tags cost ? Tag prices depend on purchase volume, functionality, features, battery life, (1 year to 30 years), firmware and packaging. Few example questions we always ask; Do the tags have to meet MIL STD 810G? Is 3 million reads or five year battery life OK? Do you need tag authentication? Do you need a security word (necessary for Issuance)? Do you need memory or just a fixed ID? Do tags need to meet HERO Zero? Do the tags need to meet ATEX Zone 0 or 1? Our tag prices are always market competitive. We always provide our non-US customers with US Govt. pricing, and in many cases that pricing is based on competitive RFP's. In most cases we are less than US Foreign Military Sales (FMS) contracts. 14. How much does a DoorGuard xP system cost ? Most RuBee systems end up costing less than competitive RFID systems that actually do not work in these security applications, especially in harsh or explosively challenged environments. Industrial RFID portals are typically over $25,000, we try to be about half or more than half that per door. Our pricing based on a catalog, is consistent and fair, depends on features, options and functionality. If you provide details to our staff we will get you a quote in a few days. Just like tags, we always provide non-US based customers with US Govt. pricing. 15. Do you have any customer reviews? Yes we have several that are not high security sites. Brookhaven National Labs installed a system to keep track of people going into a high radiation area. They tried RFID systems and finally gave up, can download summary at Brookhaven Review. That system has been running flawlessly for three years. A second review and cell phone story from a secure US Government Site can be downloaded. We have about 200 similar units in operation worldwide all in secure sites.